The West Coast Eagles State Colts Amateur Team will be led by head coach Stephen Healy in 2018. Healy capped off a successful season in 2017 by coaching the Wanneroo Drew Banfield Colts to premiership glory. He completed his Level 2 coaching accreditation and took out the West Perth Senior Coach of the Year award. In his short time as colt’s coach at Wanneroo AFC, Stephen has doubled the number of colt’s players at the club as well as producing eight league players. 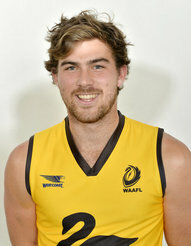 Healy is no stranger to the WAAFL State programs having been a Vice Captain of the State U23’s in 2015 as well as being named All Australian at the AAFC Carnival in the same year. He was also winner of the WAAFL LA Tetley Award in 2015 as the Best State Player. Off the field Healy has a Bachelor of Education in Secondary Health and Physical Education. Healy takes over from former Head Coach Cameron Palmer who led the team from 2013-2017.